Contemporary industrial look perfect for lofts or downtown apartments. Easy to replace bulbs or clean glass by unscrewing bottom finial cap. 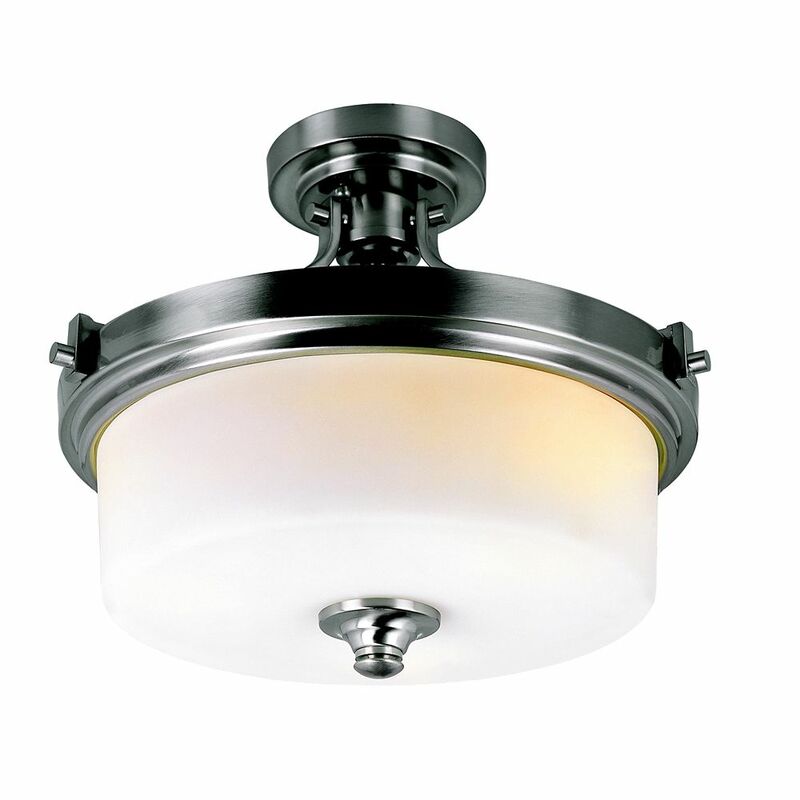 5" diameter ceiling plate semi flush fixture has knob and screw accents. Featuring softly diffused glass on a finely crafted frame, this style blends well with today's home fashion. The sleek, brushed metallic finish adds warmth and visual interest to create a distinguished appearance. Casual with a modern flair to provide the perfect accent to your decor. Nickel with Frosted Cylinder Semi Flushmount Contemporary industrial look perfect for lofts or downtown apartments. Easy to replace bulbs or clean glass by unscrewing bottom finial cap. 5" diameter ceiling plate semi flush fixture has knob and screw accents. Nickel with Frosted Cylinder Semi Flushmount is rated 4.2 out of 5 by 5. Rated 1 out of 5 by kareka from Did not know bulbs were closed on top. Thought... Did not know bulbs were closed on top. Thought it would be open so air would circulate. Would not have purchased had I known. Bulbs sit so close to metal cover and all enclosed - bad design. Will be purchasing another fixture as soon as I can afford it and the hiring of someone to install for me. Rated 5 out of 5 by Jose from Awesome looking light fixture easy to install and great price!... Awesome looking light fixture easy to install and great price! Rated 5 out of 5 by Ed from Quality, stylish light fixture. ... Quality, stylish light fixture. Rated 5 out of 5 by Lex from Dramatic light for a great price. This went into my... Dramatic light for a great price. This went into my horribly dated bathroom and made everything look elegant and a bit deco. Easy install, very pleased. Rated 5 out of 5 by AM from I like this item. I purchased this for a rental property so utility, good looks and low price wer... I like this item. I purchased this for a rental property so utility, good looks and low price were my primary focus. This item meets all these requirements and it looks more expensive than the price I paid.